Here’s a quick shot I took of what’s currently on my screen: The Black Cat’s very own “stunt” double (hairless at the moment). Used in medium to long shots, this model can be posed and animated in real time. (For those emotive close-up shots, a “hero” version of TBC is rendered in a different program.) I’ll show a demo later on of how this guy works and has solved a specific set of problems for me on The Price. More soon! I wanted to add a quick update concerning the image I posted last time of the basement stairwell. Most of the comments I received were very complimentary (for which I gratefully thank you), but a few also included an interesting observation: that the narrower dimensions of the stairs in the original animatic image added more to the sense of tension and unease I was trying to evoke than the revised set. As an artist, I genuinely value constructive critiques of my work; after looking at the same thing for an extended period, it is always a challenge to see with fresh eyes. Although I don’t feel obligated to agree with every proffered observation/opinion, I did in this case, and offer a revised version that I feel works much better. Thanks everyone! Whether you are drawing a picture, staging a scene in a play, or taking a photograph, the way you choose to present the elements of your creation to an audience has a huge impact on how they will receive the message you are endeavoring to send. There are times when I struggle to find an interesting way to visualize a scene, but this one leapt fully-formed into my mind. It made me feel everything I was hoping to convey: trepidation, wariness, anxiety and a bit of mystery as well. Although it may just be a basement stairwell, at this point in the story the audience needs to feel like there is definitely something askew with the visit of this seemingly innocuous black cat. I didn’t try to over-think things when putting it together, but the lower, canted angle, strong contrast, and the off-center placement of the doorway at the top of the stairs all combined to create the tone I wanted. It remains one of my favorite shots, so when it came time to build the actual scene, I kept the composition intact. 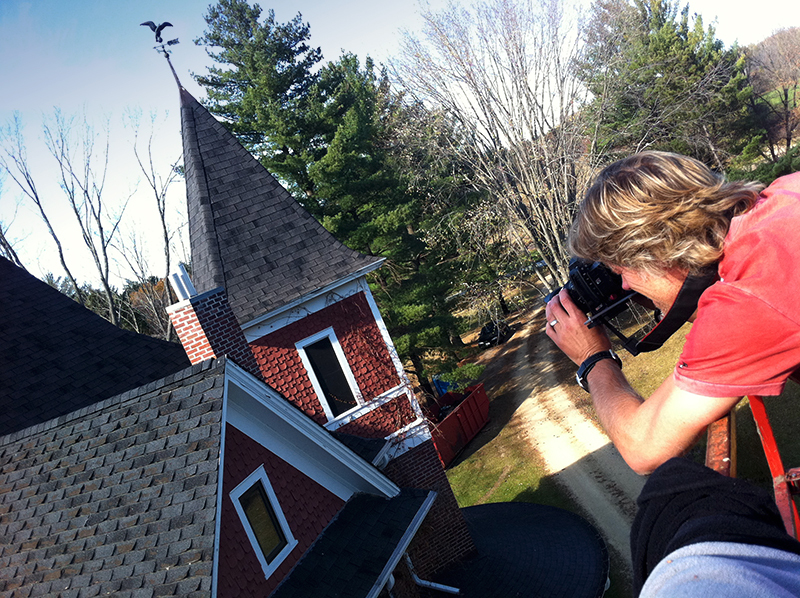 I hope you are enjoying these images and insights as much as I enjoy sharing them! Thinking on these thermal vacillations suggested an interesting detail to share with you: during my oft-referred to visit at Castle Gaiman, a roofing company happened to be effecting some repairs with a specialized truck that featured a platform attached to a crane/boom arm that could extend all the way to the top of the house (I believe they called it a “cherry picker”). With Neil’s kind permission, I had the operator take me up so I could shoot references photographs from a unique vantage point. I’m not gonna lie — it was a blast to ride in, and also an unexpected treat to experience high-altitude views of the house and property. 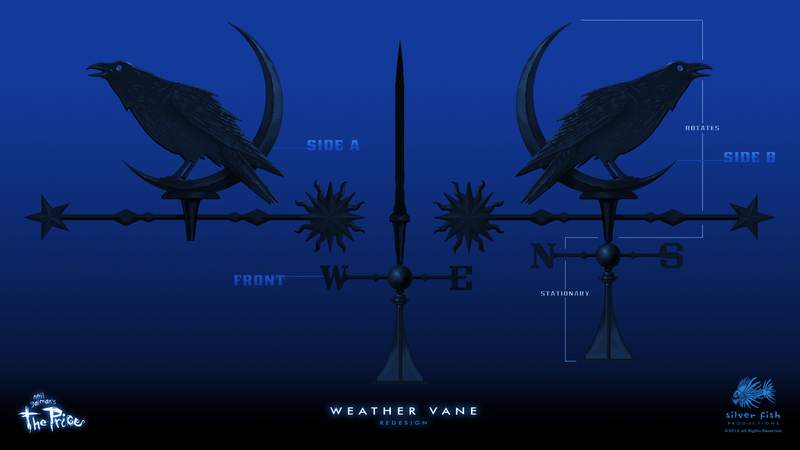 One of the details I was excited to see in person was the distinctive weather-vane that adorns the tower at the front of the house. Although interesting in its own right, I wasn’t as keen about the design as I had anticipated. After reviewing the photos later, I still felt a bit disenchanted, and decided my Castle Gaiman would need to have something a little more…spooky. It’s at this juncture in the story where bad things begin to occur, and which seem to be somehow connected to the Black Cat. I’m hopeful that this imagery won’t feel too “on-the-nose” to viewers, but will impart a subtle sense of foreboding. For this week’s post (yes, I am going to post something every week from here on out — even if it’s just a quick, frustrated blurb or scribbled drawing of some sort), I thought I’d share this image of one of the featured locations in the film: the basement. When developing the animatic, I realized this was one of the sets I couldn’t just “fake” with a simple image for the background, as I had to generate multiple shots from very different angles. Luckily, these renders were very simple, didn’t have any real textures or colors to worry about getting right (as the images were eventually turned monochromatic), and were only meant to get the general idea across. If you look carefully between the two versions, you can see that I’ve re-purposed some of the same models (although they have been upgraded significantly). At any rate, I hope you enjoyed this quick peek; have a great week! PS: For the record, Neil’s basement looks nothing like this. 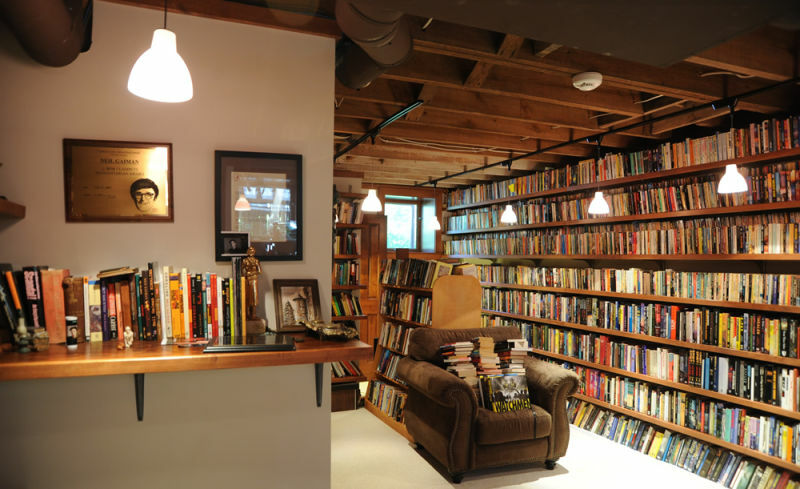 It’s got a marvelous library, tons of comics, and is both inviting and comfortable in every way; that wouldn’t really work too well for the movie — I want my basement scary and mysterious! I didn’t have much of the geography around the house worked-out beyond some grass, a bunch of trees in the distance and a road. In fact, if you look too long at this frame, you’ll find all sorts of things that don’t make any sense — but the point of the shot was, “Look! There’s a mailbox!” and maybe a little bit of, “Oh yeah, it’s rainy and gloomy too,” thrown-in for good measure. I was never happy with the original shot, but didn’t have any clear ideas on how to make it better until my dream-like visit to Castle Gaiman. Turning off a dark country road to move slowly up the gravel driveway toward this eclectic home which had figured so prominently in my imagination over the past few years was beyond thrilling, and surprising as well. The trees lining either side were larger and more mature than I had pictured, and the driveway itself far longer. These impressions recurred during the next two days as I walked around the property taking reference photographs. In particular, the view from either end of that driveway, with those tall trunks framing its length was quite striking. All of these perceptions were added to the jumbled pile of ideas rolling around inside my head. They eventually emerged as an idea for adding a wider establishing shot at this point in the film using a similar composition (along with fog for separating the layers of the image and increasing visual interest). In terms of sharpening the cinematic language of The Price, intentionally cutting from such a wide shot down to a close-up of the letter received from the author’s distraught daughter is a bit jarring, and helps add to the building unease of the sequence. Now, I also wanted to elaborate on the current state of the film and where things are headed. I had an opportunity not long ago of attempting to do exactly this with my youngest brother, Jeff. Living almost 1100 miles away, I don’t often get to visit with my family; unfortunately, the reason this time was neither fun nor recreational (I’ll get to that a little later). At the beginning of my Kickstarter campaign for this project, I had determined not to attempt full-blown animation as the cost, time, and manpower wouldn’t justify the production of a short film with no real chance of making back any investment. Besides, the style on display in the animatic seemed to be intriguing to viewers — having images that blended between poses like a moving graphic novel. That was an approach I could handle mostly on my own, and for a far more reasonable budget. After years of fruitless searching for a way to fund The Price, Kickstarter suddenly appeared on the horizon, and I knew how this film could finally happen. 33 days and 2001 backers later, it was on! To wit: the character models were designed and built with the intent that they be posed and rendered as single images rather than a series of animated frames. 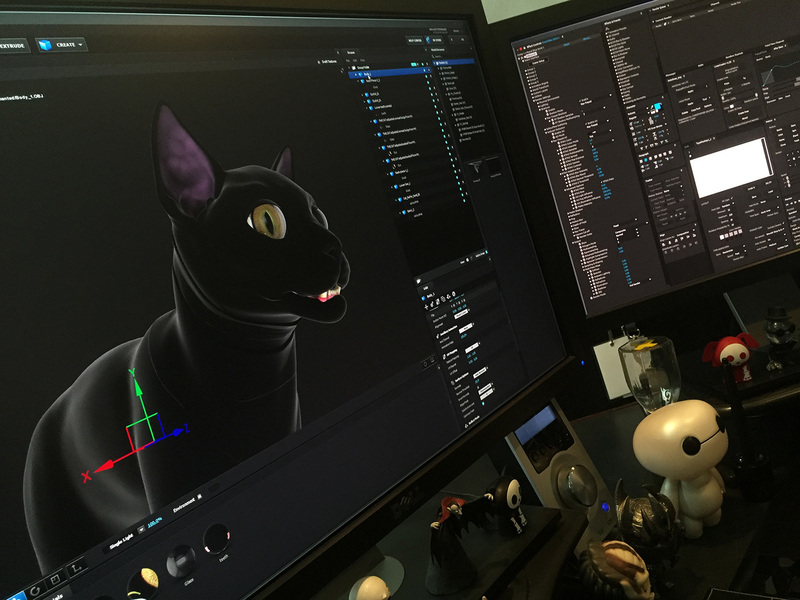 These digital sculptures, created by Ryan K. Peterson, were phenomenally crafted, but proved difficult to translate from the sculpting software into another 3D program that would create the hair/fur needed, allow each model to be moved into the requisite poses, and then rendered with the correct lighting and materials (for example, having skin with translucent properties). We tried multiple methods and insanely over-complicated combinations that all yielded disappointing and compromised results. Time was ticking away, and every road seemed to lead nowhere. The sets and environments had their own issues as well. The model of the house was large and unwieldy, and getting it to render was also a royal pain! 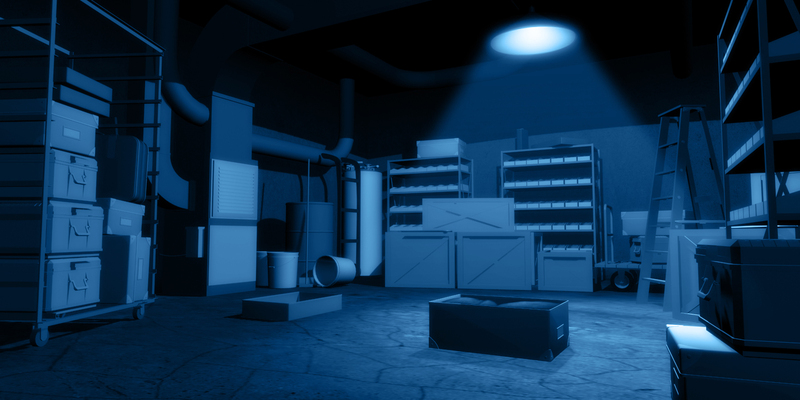 Using a traditional rendering pipeline meant having to wait for long periods of time (even hours, when you only have one machine working on it) before you can see if you placed your lights properly, had everything aligned in the shot correctly, or if the overall look was somewhere even close to what you had been aiming for. It was like moving things around in a darkened room, then having to wait for the lights to finally come on in order to see what you had done — argh!!! In a full animation studio, there are many groups of skilled artists and technicians that focus on specific problems and details like these (not to mention the vast rendering “farms” created from hundreds of dedicated CPUs to crunch all of that data). I had just a few guys contracting with me to build/create the things that I couldn’t, and then I was to combine all of these custom pieces together myself. I began to realize that despite my initial, more modest ambitions, what I actually wanted now was to try and create a full-blown professional-grade product, only it had to be made by hand on a very limited budget. Regardless, I was determined to fight my way through these obstacles, even as they continued to pile-up in relentless fashion. Then, as time continued relentlessly by…something changed. 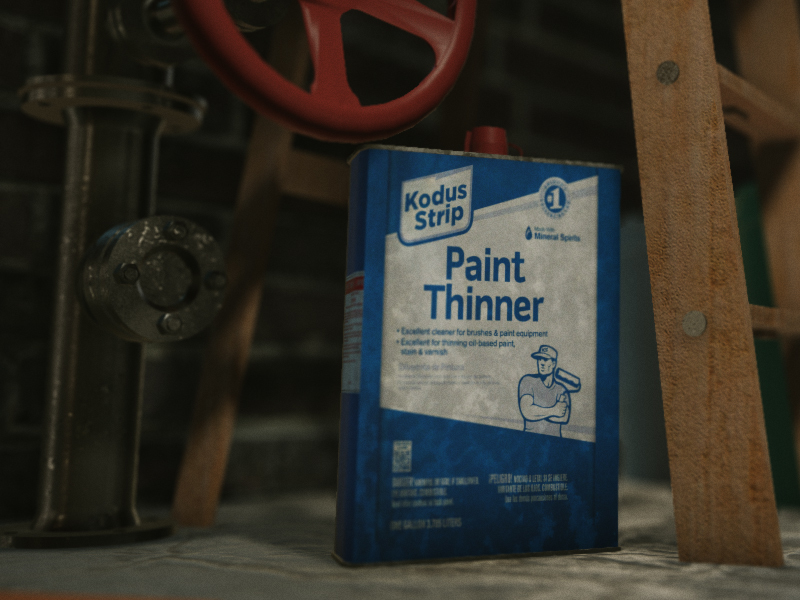 Suddenly, the sculpting program we used introduced newly-developed tools, and partnered with a company whose ground-breaking renderer could import the files directly and render them quickly, right in front of your eyes. You could tell within seconds if the lighting design worked, and the model materials looked like they were supposed to, with hardly any major tweaking — it was mind-blowing! Then, a whole new world of possibilities opened up with a program called Element 3D, created by Andrew Kramer and Video Copilot. This special plugin allowed 3D models to be opened in Adobe After Effects, the program I use for compositing all of my shots, and with which I feel extremely comfortable. What all of that means is I could now bring my house model into After Effects and light it, position and modify it all in real time! I had immediate results that would respond instantly as I changed parameters and settings, using the same kind of GPU magic that today’s highly sophisticated videogames also use. Having instant feedback so I could dial-in the look of these models was now a reality — and I could do it myself on my single (though admittedly, crazy-powerful) workstation. Light bulbs (Edison again) were literally popping-on in my mind like machine-gun fire! Can you see where all of this is going? Imagine, after spending years of tinkering, trying to put a car together in your spare time with a bunch of custom-made components, you realize you now have the ability to build something more sophisticated, powerful and even more beautiful…but that means taking it all apart and then putting it back together in a new and different way. That’s the best metaphor I can think of to describe where things are. None of the parts that have been worked on so diligently have been cast aside or wasted, just used in a better, more advanced fashion. I’ve stated this before, but it bears repeating here: even more than money, my Kickstarter backers have afforded me the rarefied opportunity to create something at my very best, A+ level. Because there is no paying client waving a glaring deadline in my face, I can listen to that aesthetic-driven voice in my head that sees a better way of putting things together. Trying to explain why an artist should pay heed to that voice is difficult — how can you quantify inspiration or justify a creative instinct? Of course, this process takes time. We all have lives to live, and life frequently requires things of us that we may not have accounted for. Now back to why I was visiting my brother Jeff: he called early Sunday morning on the last day of January to tell me that our father had suffered a heart attack; less than an hour later, he called again to say that he was gone. 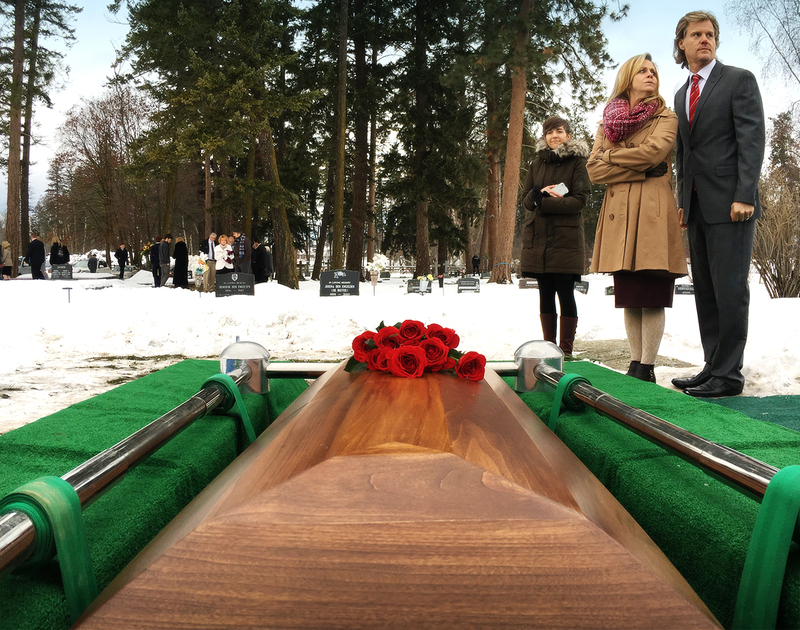 I stayed with my Mum for awhile after the funeral. She has a wonderfully resilient outlook, but now bears the burden of living alone and managing the small farm that our family enjoyed so much growing up. Life has drastically altered the rules for her, and yet she is finding her way along this new path. That’s what we all do. My wife always refers to Dory’s refrain in Finding Nemo as our family motto: Just Keep Swimming. Sure, that sounds especially fitting when you consider that our last name is Salmon, but there is a profound truth to be found as well. You just keep moving forward, no matter what comes your way. And often, those life events are joyful and glorious: last month, my daughter Shain (who took the marvelous picture above) was married to her best friend (a really great guy), the first of our children to do so. Above all, family remains the highest priority, despite schedules brimming with responsibilities and activities that demand our time and attention. Having the chance to make this film in the way that I want to is a great privilege, one I feel immense gratitude for. The constant support and encouragement from the vast majority of you, including Mr. Gaiman, helps more than you realize, especially on those days when the obstacles loom large and discouragement tries to worm its insidious way into my heart. But I’ll never give up. It’s simply not an option. Neil said that I fell in love with The Price, and that really is the best way to put it. Of course I am anxious to have it finished — and I will always maintain that no one wants to see this movie more than I do! I constantly daydream of being invited to some sort of Gaiman-centric event one day in the near future and being able to show it to all of you, getting to feel your response in person. This project has been part of who I am as an artist for so long now, I will always feel a deep connection to this moving and thoughtful story of when The Black Cat came to stay. So don’t give up hope; I may still be walking down that lonely road, but know I will be returning soon to share what I’ve found along the way. In an effort to post more frequently, I’ll spare you the lengthy epistle this time around, and share an image instead: Many details here were inspired by my visit to Castle Gaiman, but as with the layout of the other interior sets, I have taken many artistic liberties in order to capture the angle, composition and mood I’m trying to achieve. And for any of you CG-geeks out there, this entire set is built and rendered in real time (courtesy of Video Copilot’s Element 3D), all inside of After Effects — pretty cool, right? Hope you enjoy the sneak-peek — more to come! 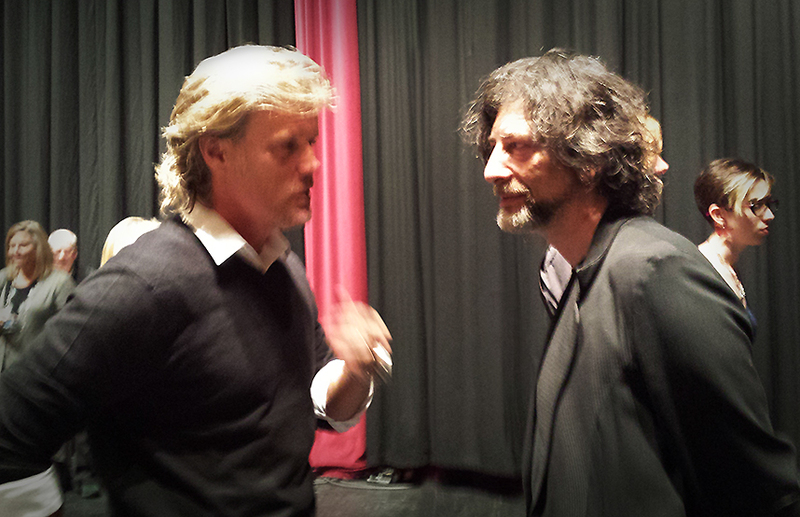 Given how long this production has taken, you can see why I was a little concerned at what he might say, face-to-face. Well, I needn’t have worried. 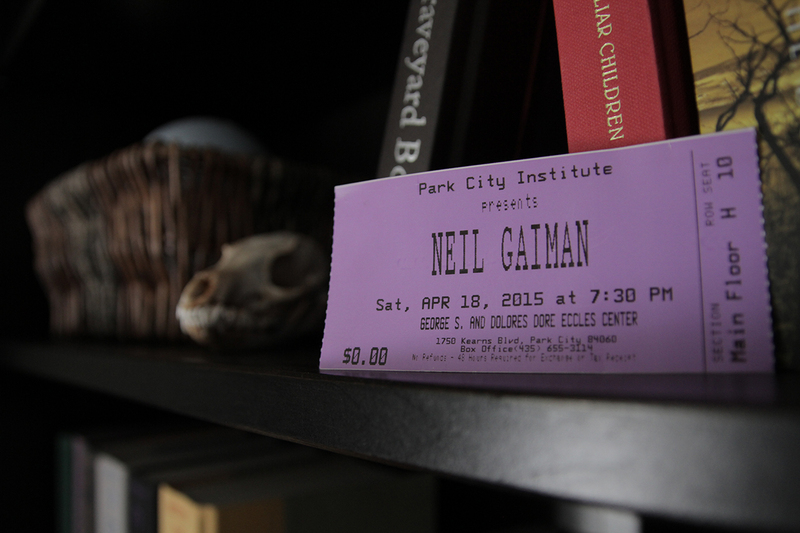 Once we arrived and gave our names to a very helpful staff member of the Park City Institute venue, we were escorted backstage to join a group of about 40 other people, who were milling about and eating snacks while awaiting their turn for an audience with Mr. Gaiman. Glynis and I took our place in the queue and watched him take his time greeting fans and chatting amiably with each one (I’ve noticed with amazement at how patient and genuine he is with people in general). After listening for a moment, my wife leaned over and whispered, “Wow, that voice…” She has become well-acquainted with its tone, timber and cadence, having heard his recorded narration of The Price on countless occasions (mostly as it issues forth with regularity from my basement cave/studio), but it is exponentially more mesmerizing in person. I kept stealing glances at him and noticed he looked a little different since I visited Castle Gaiman 4 years ago, most notably with the addition of a beard. At one point, he actually called out “Hello Christopher,” while finishing-up with his current guest. Then it was our turn. I said hello, shook his hand and hugged him, and introduced my wife. She has a natural grace with people no matter the circumstance, and stepped over to him, saying easily, “I have to give you a hug as well!” Then while still hugging him, she said very quietly, “Thank-you for believing…” As her voice started to break, the moment became something tender and heart-felt. He hugged her back with genuine affection, and the last vestiges of my anxiety melted away completely. We had a wonderful conversation (while several of the bewildered guests backstage looked on, no doubt wondering why they didn’t get a hug); I mentioned his beard (“I do some teaching at Bard’s [a College in NY] and so I needed to actually look like a professor for the students to take me seriously.”), congratulated him and wife Amanda Palmer, who are expecting a baby in September (“I’m absolutely terrified!”), and that led us to talking about families and sibling age differences. Then, in a more somber tone, he said he knew that our family had experienced some very difficult events recently​, to which Glynis replied, “Yes we have; but everyone has their own trials to go through, don’t they?” Neil paused and said thoughtfully, “It’s true, we all do.” Again, her response was perfect and seemed to acknowledge his sympathies without making things feel too heavy. Later there was an after-party held in a local gallery where we had a chance to meet other NG admirers and talked with two different couples who recognized me and were following the progress of my little film (one was a Kickstarter backer, the other had attended a presentation I recently gave at the Life, the Universe and Everything Symposium). It was humbling and extremely gratifying to feel their enthusiasm for the project. Despite the occasional negative comments I get, having the opportunity to interact with people standing right there in front of me who are as excited as I am to see the finished film was uplifting and hugely inspiring. I drove home that night wondering at how — just when your reserves feel as though they are about to run dry — these incredible experiences seem to come along in the proverbial “nick-of-time.” Personally, I don’t believe them to be coincidences. Getting those gentle reassurances was exactly what I needed… and now I pass them along to you. I wanted to show this for a number of reasons, but mostly because it fills me with hope and anticipation every time I watch it, and I think it will do the same for you. The opening of a film can set the tone for the rest of the story, and helps guide the audience into the experience. The idea of coming up out of the darkness and into a colorful, inviting world really appealed to me, and I felt it would connect viewers to this place that is the home of our story’s narrator, and imbue a sense of its value to him (it is called “The Price” after all). As I mentioned in a previous blog, re-visualizing this scene was aesthetically challenging, but from a technical standpoint, this shot was a real beast! It represents the culmination of months of effort and experimentation to arrive at a solution that yielded the results I was striving for. Initially, the plan was to use the beautifully designed and created 3D models my team had developed to generate still images or poses that I could blend between, similar to the technique I had used for the animatic, but refined and unified visually. However, the more time I spent with these models and saw the enhanced possibilities of how much more could be achieved with them, I began to re-think my process and started looking for alternative methods I might employ. Not unlike attempting to build a car from scratch, I had most of the parts I would need and examples of how others had built their vehicles; now I had to determine the construction process for my own unique creation, and see if I could get the thing to run. But when the pieces do come together, and you catch a promising glimpse of something shiny and bright, you feel that spark of genuine excitement flare-up and everything seems right again in the world. PS: Here’s a link in case you missed Mr. Gaiman’s delightful interview last week on NPR’s The Diane Rehm Show (two of my all-time favorite voices). One of the (many) difficult aspects of creating filmic images from a computer is being able to light things the way you would like. In the real world, you can use actual lights and place them relative to your subject to achieve the look and feel that good lighting can provide. Since the “actors” and objects in my film don’t exist except as zeros and ones somewhere on multiple hard drives, this process can be much more difficult & tedious. On the left is part of a rendering with pretty flat lighting, where I wasn’t concerned yet with trying to create the stylized, moody lighting that the final scene would have. The center image is the normal map; although it looks like something out of a 70’s-era DoodleArt poster, the intense and varied colorations on the image “map” out which way each individual surface of the model is facing. 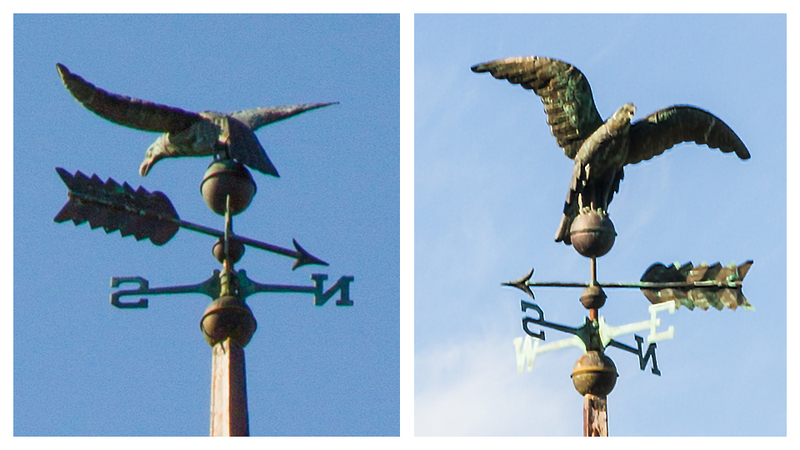 The image on the right was produced by combing both of the other images in Adobe After Effects (the compositing/special effects/animation program I am using to generate all of the shots for The Price) and introducing new 3D lights to create the look I want. This process is enormously freeing, as I can rework it at any time to conform to new ideas or scene configurations without having to spend hours rendering just to see if an inspired thought had merit or not. Pretty neat, huh? Here is an image from the same rendering I thought might be helpful for keeping everyone in the proper ‘spirit’ this week. Enjoy, and have a safe & spooky Halloween!